Ended up once again on all 4's in the forest creeping slowly towards a rabbit outside in the field. I just got close enough after some serious stealth work, and after not shooting bunnies for so long, my adrenaline was so high I couldnt hold the gun straight.. so I decided to creep a little closer, which worked, the bunny was now aware of something green slowly moving through the bushes at the edge of the forest. I was just brining the gun up.. and off he hopped.. damn.. theres me laying down, rifle resting on the wire fence, ready to shoot.. but I end up laying there for nothing good practice though. So walked along the forest a little more, plenty of squirrels, one good one in range.. pop.. miss.. doh! Kept walking, and I saw him again, running through the trees. I was determined to get him.. so I stealthily crept through the trees, bushes, and mud to follow him. He disappeared up a tree, but while I was looking for him in the tree, I spotted a second on sitting on a branch slightly down a bank, nibbling something and not to bothered about me there. He was maybe 20 yards away, I got a steady aim from a nearby branch, and pop.. sent him down the branch to the ground with a couple of twitches. The pellet hit him just behind the ear.. perfect. Its not always they die instantly like that.. usually squirrels require an extra shot, even if hit squarely in the temple area. But since this one wasnt too scared or aware of me, it took him by surprise. I have hunted squirrels for a while now, but never eaten them. 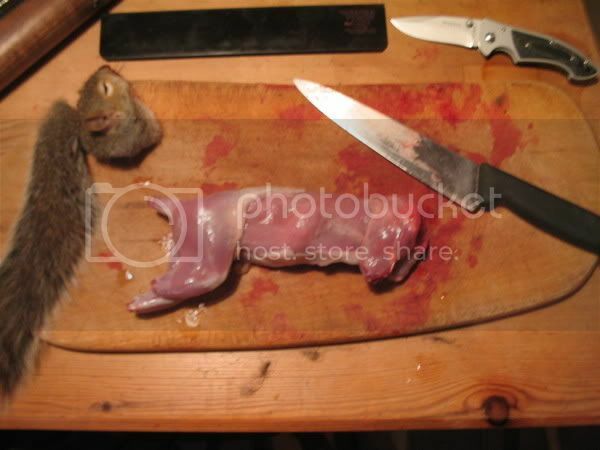 So here was my first go a preparing a squirrel.. from the field to the plate. 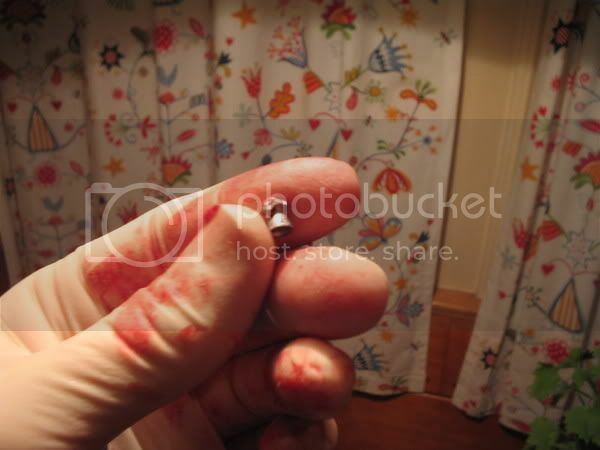 I extracted the pellet from the head. 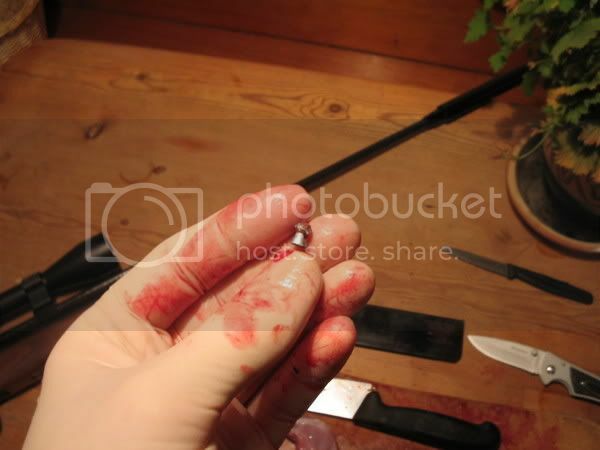 Surprisingly very little damage to the pellet, but the skull was cracked in many places, and he had been bleeding a lot. a single cut all the way around the animal just bellow the shoulders, and peel both bits off the opposit way. But first get a big knife, and place it on the leg joints (one a time) and bang down with the palm of your hand, then slice. Same for the neck, this cleanly breaks it, and a quick slice will remove it. Again the same for the tail. After this, cut the pelvic bone with a large knife, then remove the rest of the insides that are trapped behind the bone. After this, wash the animal properly, to remove hair, blood etc. Now.. lay the carcass in a tray, pour oil over it, and sprinkle with salt, pepper, and spices. Then into the oven! 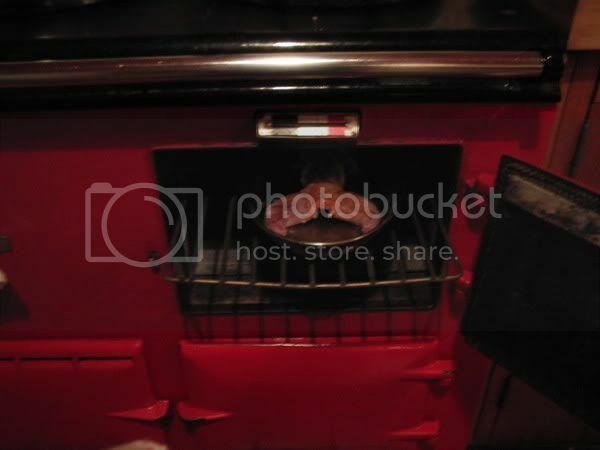 (ours is an AGA) This takes about 35-40 mins. 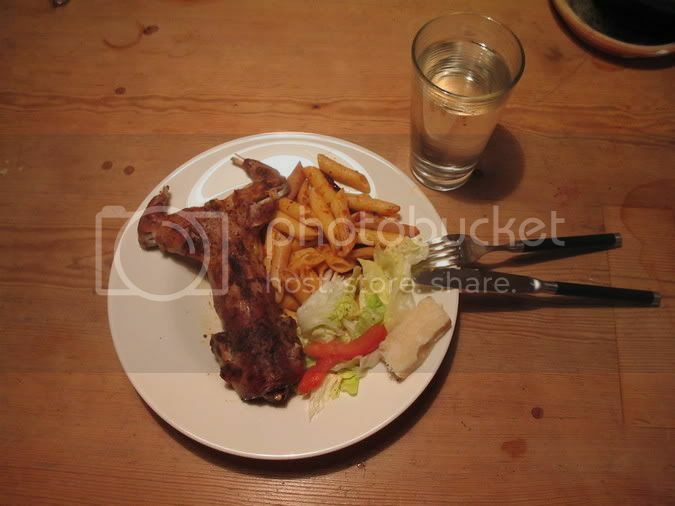 And the meal is ready.. Good appetite! I must try tree rat sometime... Nice shooting by the way. I think this should be pinned. Your wish ..... my command. Nice to prepare because they dont have the same game smell as rabbits, which put me off a little.. as im sure it does with most people. These have no smell, hardly any insides to remove, and make a nice tasty meal. what does squirell taste like, i suppose it might taste like rabbit? ? Were you using accupells? if so would you reccomend them? 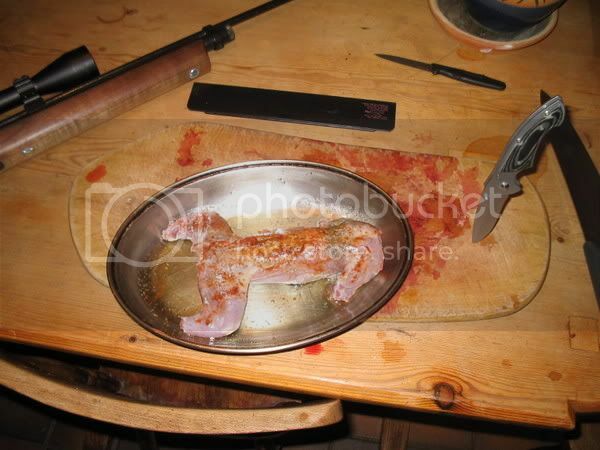 Interestingly squirrel has its own flavour, I havent tasted this kind of meat before. Its not strong though..
Im currently experimenting and testing the newish Logun Penetrator pellets.. il let you know how they go. 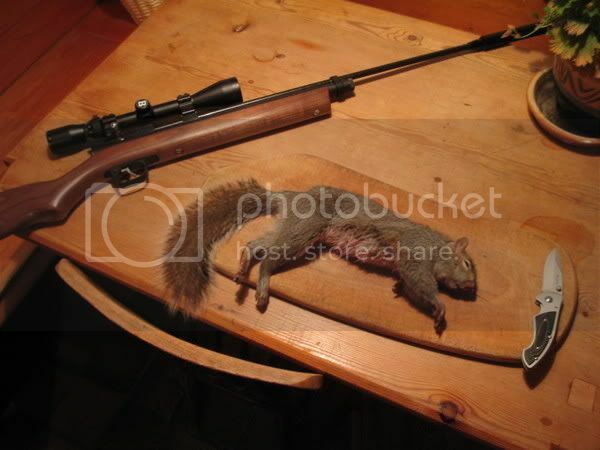 But I did take a squirrel with a neck shot with one some time ago, and he went down without a twitch. So they look promising, but when I did a big accuracy test with Rabbitsopper rifle, out of 5 pellet brands, the Webly pellets out performed them all, so I kind of left the other boxes of ammo locked up in the gun safe, and stuck to Lazadomes for my current rifles. When summer comes, il have more time to play and test them out. Your treer rats must be different to the ones i shoot. Yes they are nice to eat, but when skining/gutting i find they have a very stronge sweet sickly smell. 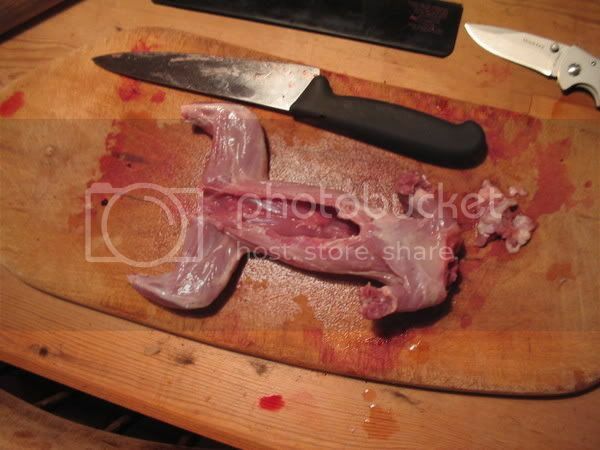 What with this and skinning matching that of the oldest buck Rabbit i have left them for the foxs after culling. With them in not such good condition this time of year, maybe i will give them another try in the fall when they are at there best. what does squirell taste like, i suppose it might taste like rabbit?B)? nice pictures m8, i will try it some time. hi m8, found this vid, just woundering, is this how you do yours. Nope.. took me much longer as I never did it before, but I will do that next time for sure. Anychance someone can go and get it for me please? I've got loads of squirrels in my garden and wouldn't mind trying it. I'd imagine that you skin it the same as how you would do a wabbit but I wouldn't mind watching this video. Change of browser and life is complete. I've just found another meat source! Brilliant! Glad you injoyed the video m8, i also havent tried eating one yet and would love to. Let us know what its like. Doesn't it taste a little...................nutty! I'll try 'em - but someone else has go to do the cooking !! !